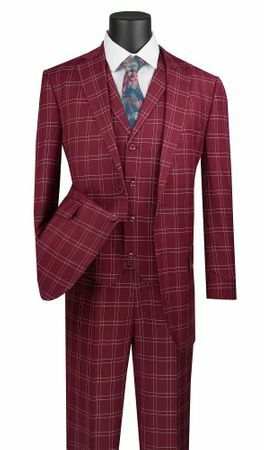 When you like stylish suits, you need this burgundy plaid 3 piece suit with the 1920s style lapel vest in your life. The says modern but throwback at the same time. The jacket on this burgundy plaid 3 piece suit has a double vented back in a regular fit. The classy 1920s style lapel vest is a statement on it's own. The pants are single pleat style and ready for hemming. All made of fine poly/rayon wool touch material.